Guitar chords are most often used when playing rhythm guitar. The instructions on the outlines below direct you where to place your fingers on the fretboard. You can then simultaneously strum most, if not all of the strings on the instrument, and it will sound good. Different chords create different sounds. Major chords sound brilliant and cheerful while minor chords sound intense and sad or angry. Open chords are commonly used in folk and rock and often create a constant background for the music. 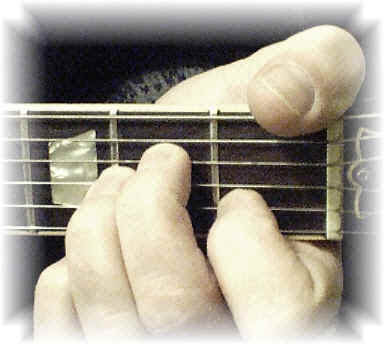 Barre chords give the player the ability to take a more percussive approach to playing rhythms. They are frequently used in rock, funk, reggae, and jazz. Chords are many times played with sweep or cross picking, creating and effect where each individual note can be heard.